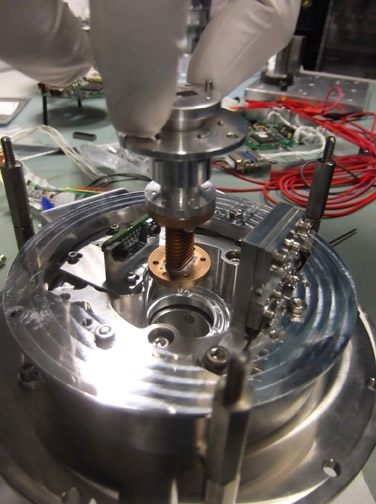 Link Microtek has designed and produced a spaceflight-qualified microwave rotary joint and associated waveguide components as part of a Ka-band antenna pointing mechanism (APM) being developed by Surrey Satellite Technology Ltd (SSTL) - an independent company within Airbus. Destined for use on low-Earth-orbit satellites, the Ka-band APM will enable high-data-rate information, such as high-resolution images or video, to be transmitted to a ground station as the satellite completes its rapid traverse of the sky. Within the APM, the rotary joint performs the critical function of feeding the RF carrier signal from the static side of the antenna to the rotating side. SSTL’s APM design includes two Link Microtek rotary joints – one for azimuth and one for elevation – as well as interconnecting waveguides, which are made from aluminium to minimize weight and are crucial to the overall RF performance of the system. Each rotary joint has a single-channel, non-contacting design covering the frequency band from 25.5 to 27.0 GHz. Also made from aluminium, the rotary joints feature a WR34 waveguide interface on both ends and a bespoke flange design. The measured RF performance is impressive, with a very low maximum insertion loss of 0.29 dB and maximum VSWR of 1.28:1.